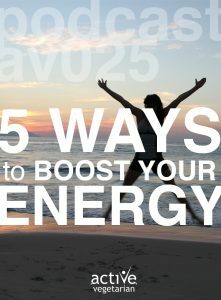 In this episode of Active Vegetarian we discuss 5 energy-boosting changes you can apply to your daily routine that will leave you feeling recharged. If you’re tired all the time, a change in what you eat or what you do all day may be all you need to turn things around 180°. You might not be able to do everything we listed all the time — but do try them all to see which ones work for you and your schedule. Add these tips to your regular routine. Or mix them up to keep things interesting.